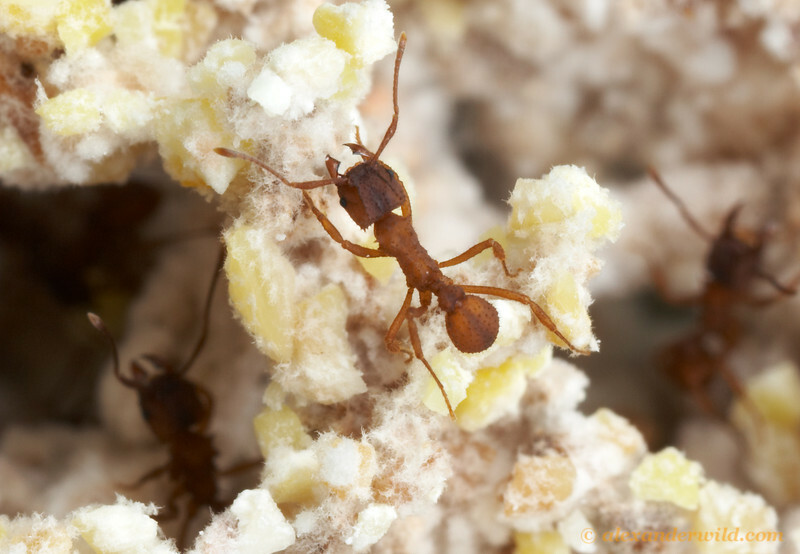 Worker of Trachymyrmex septentrionalis tending fungus, photographed by Alex Wild. The Attini, including the leafcutter ants and allied taxa, are a clade of ants characterised by the cultivation of fungi for food (Schultz & Brady 2008). Female attins, upon leaving the parental nest, carry a sample of their food fungus with them in order to start a culture in their new nest. The ancestral attins cultivated fungi of the Leucocoprineae, but one subgroup of the genus Apterostigma cultivates coral fungi of the Pterulaceae. Leafcutter ants, including the genera Atta and Acromyrmex, cultivate a single derived fungus species on pieces of leaves that they collect and carry back to their nest (Schultz & Brady 2008). [CM07] Curtis, D. J., & G. Machado. 2007. Ecology. In: Pinto-da-Rocha, R., G. Machado & G. Giribet (eds) Harvestmen: The Biology of Opiliones pp. 280–308. Harvard University Press: Cambridge (Massachusetts). [H79] Howse, P. E. 1979. The uniqueness of insect societies: Aspects of defense and integration. In: Larwood, G. & B. R. Rosen (eds) Biology and Systematics of Colonial Organisms pp. 345–374. Academic Press: London. [SB08] Schultz, T. R. & S. G. Brady. 2008. Major evolutionary transitions in ant agriculture. Proceedings of the National Academy of Sciences of the USA 105 (14): 5435–5440.